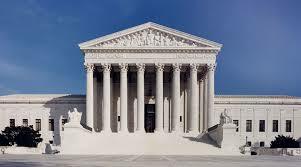 OKLAHOMA CITY (AP) – The U.S. Supreme Court will not review the sentences of two Oklahoma inmates who argue that people of color are more likely to be sentenced to death in Oklahoma when the victim is white. The court on Monday declined without comment to review the separate cases of Julius Darius Jones and Tremane Wood, whose first name is spelled Termane in state court documents. Jones was convicted of killing Paul Howell during a 1999 carjacking and Wood was convicted of killing Ronald Wimpf during a robbery. Both victims were white. Jones is black and Wood is biracial. Attorneys cited a 2017 study that found nonwhites are more likely to be sentenced to death in Oklahoma when the victim is white. Defense attorney Dale Baich told The Oklahoman more appeals are planned.